Had a team Xmas booze up last night and you can imagine how I feel today. Well, at least I managed to get to the office on time. Did bring my leftover mutton curry for lunch but need some comforting as I’m feeling rather fragile. 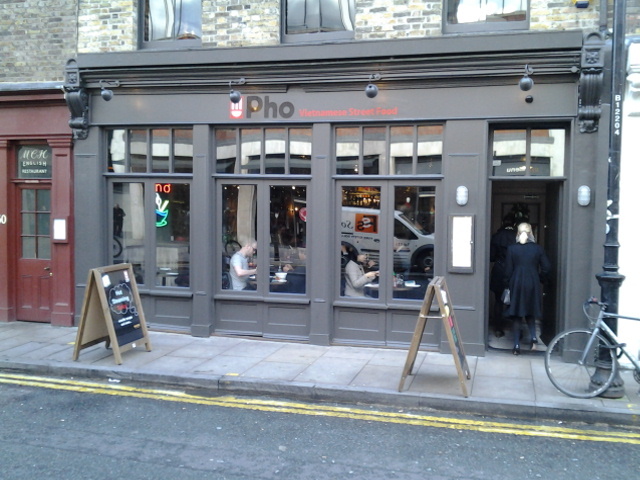 Weird that seeing I’m such a big soup noodle fan, I only went to Pho at Spitalfields once. 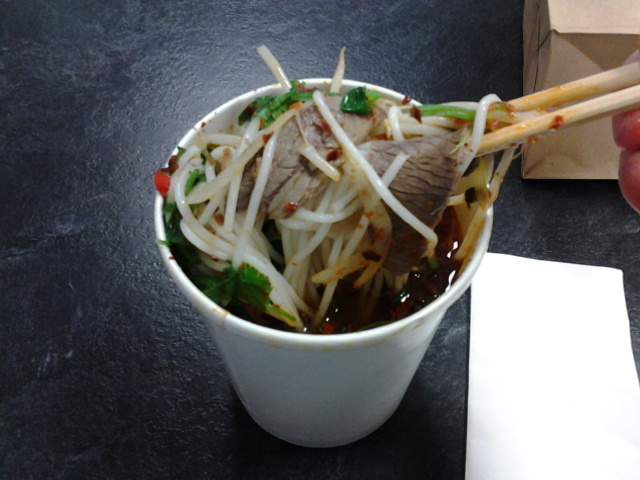 Instead of ordering my usual pho, I decided to order a bun instead, the Bun bo Hue to be exact . Not bun as in a bread bun silly, it’s Vietnamese and refers to the cylindrical rice noodles used in the dish as compared to the flat rice noodles used in pho. 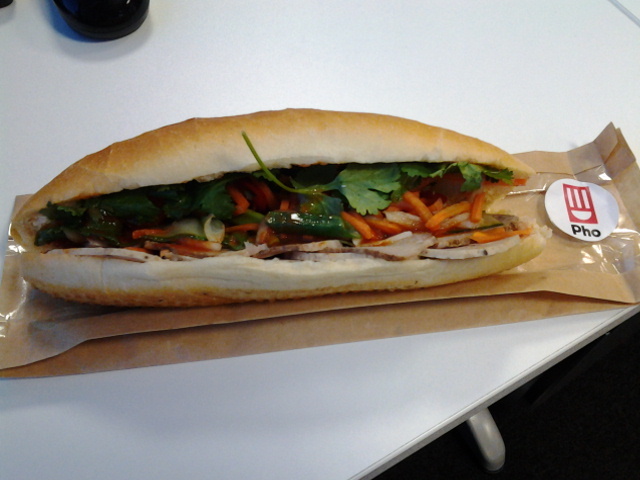 Also ordered a banh mi in case I still feel hungry after the noodles. 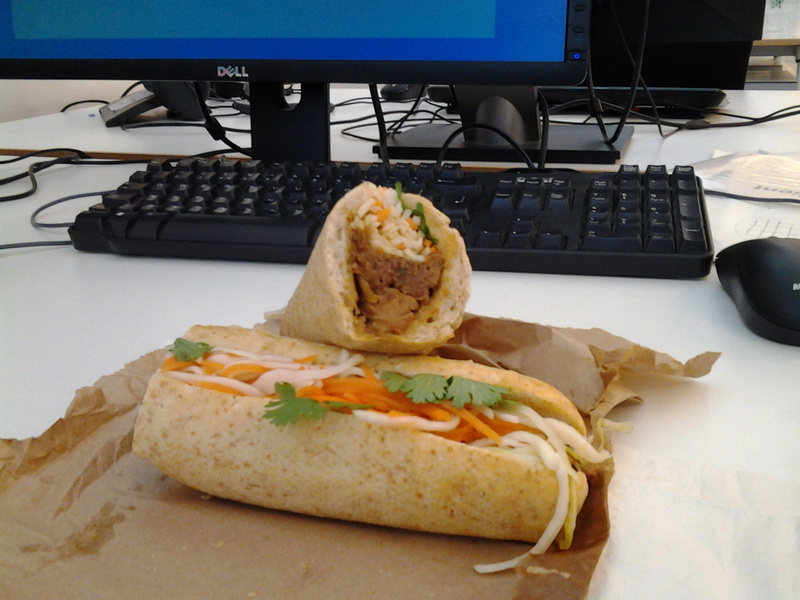 The bun cost £6.45 while the banh mi was £5.50. Not a cheap lunch but the Junk needed some soothing. Like the pho, the Bun bo Hue came deconstructed, almost all components are packed separately to ensure freshness but can be a pain if you are starving. I guess it makes putting together a takeaway order easier as well as I bet the kitchen would have packed some containers beforehand. 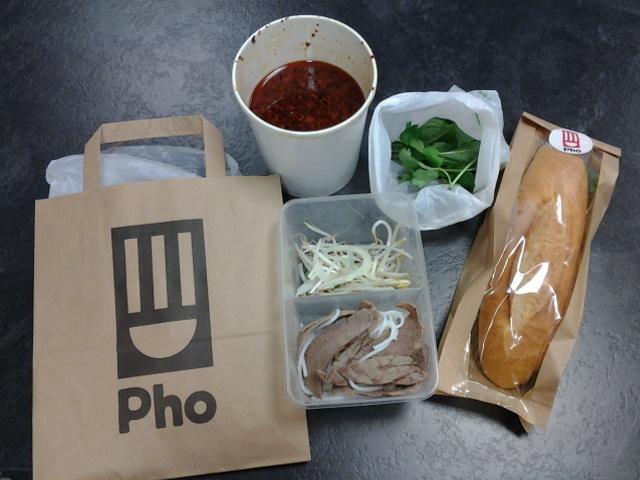 The bun was a nice change from the usual pho, the broth was spicy but still has a deep beefy taste. The lean beef was thinly sliced which is good and the plethora of herbs added freshness to the dish. Only complain would be that the portion seems to be rather small, much smaller than I recalled. 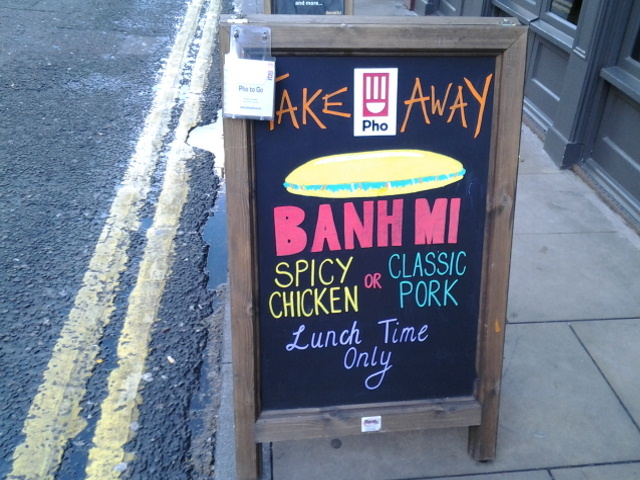 There was 2 options for the prepacked banh mi, a chicken and a grilled pork. I went with the grilled pork and was pleasantly surprised that it’s says Banh Mi dac Biet on the receipt. if I’m not wrong, dac Biet means special in Vietnamese. You will be asked whether you want to add some Sriracha sauce (thai chili sauce) to be added while the Maggi seasoning sauce is added by default. The baguette is nice and light, pretty close to the ones I had when I was in Ho Chi Minh with slices of roasted lean pork, a smearing of pate and stuffed with picked mooli, carrots, coriander and spring onions. Perhaps I waited too long to have it, the baguette went a big soggy on me. How I wished I had more banh mi when I was in Vietnam, the £5.50 I paid could have bought me probably 10! 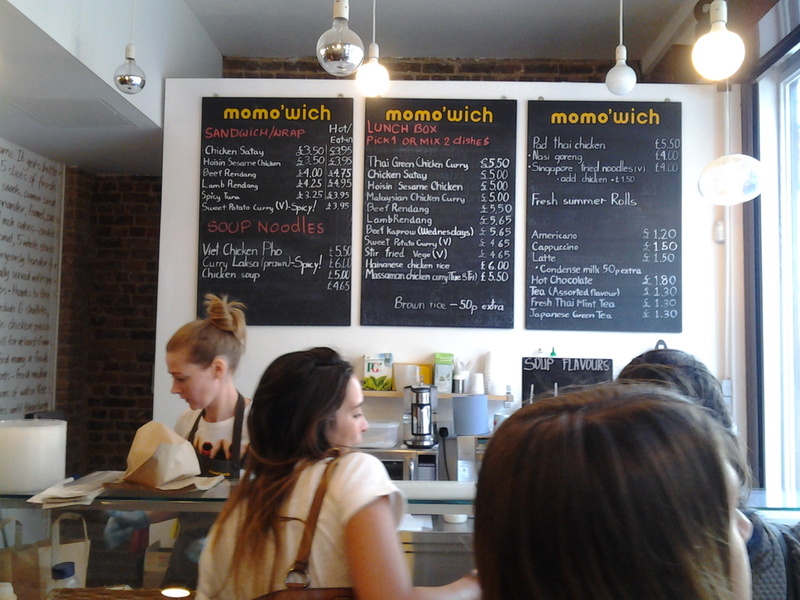 Today’s shop Momo’wich caught the corner of my eye when I went to Mama Thai with Mr CSS a couple of weeks ago. With a “wich” in it’s name, I was expecting a regular sandwich shop but was pleasantly surprised when I went hunting for it on the interweb. With a byline of “Pan-asian bites”, it serves rice, noodles, salads, wraps as well as filled baguettes. 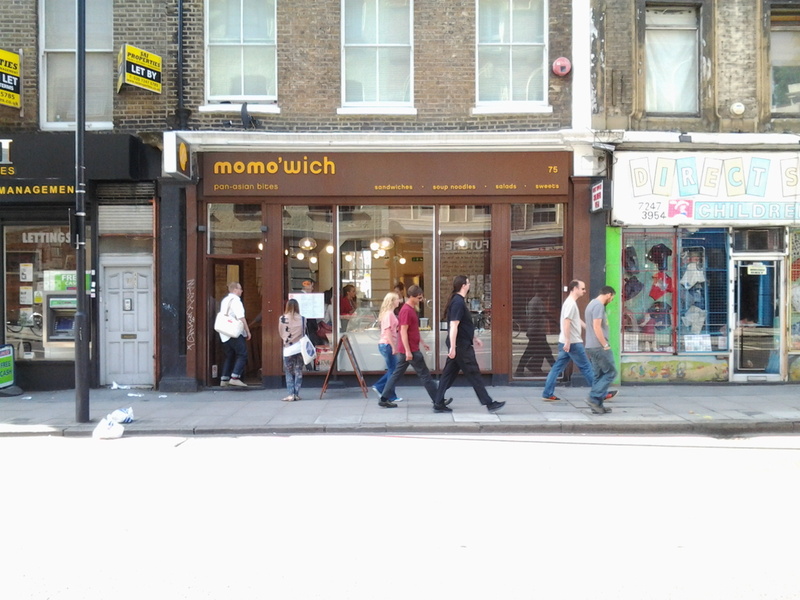 Momo’wich is located along Commercial Street and looks to be rather new. It is quite spacious on the inside with a small steamer table with dishes ready to be doled out and a fridge area where you can find drinks, salads and soup noodle containers. Guess it is like other places where you pickup a soup noodle container and get it top up with soup at the steam table counter. There are a couple of long tables and benches where you can eat in. I especially like the fact that a beef rendang recipe is artistically written on the wall as decoration. There are 2 versions of the menu, not sure whether there is difference. I think the one on the blackboard accurately reflects what is available on the day. Can you spot a difference? Momo’wich’s website also give you the option to order delivery or collection. I think there is a minimum order of £15 for delivery but if you order to collect, they give you a 5% discount off your total bill. 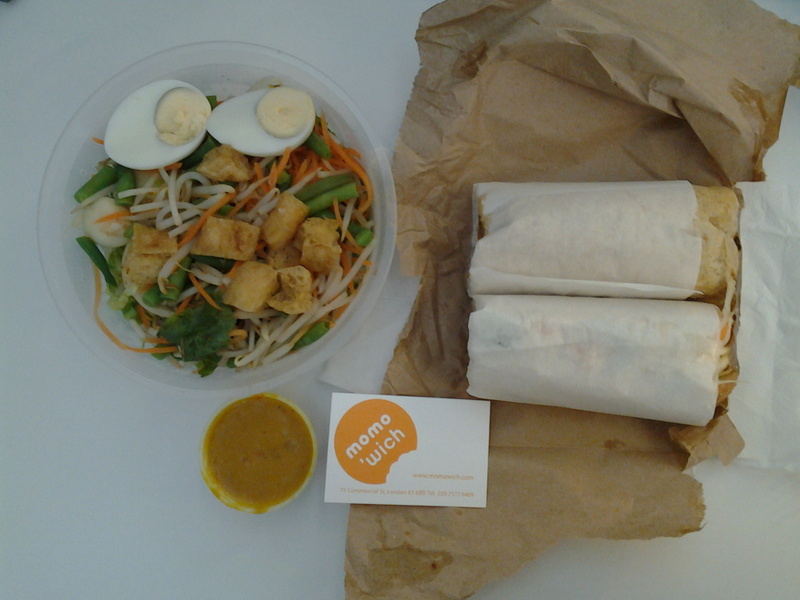 I decided to go with the Gado-gado which is a Indonesian salad and a Beef Rendang Baguette. 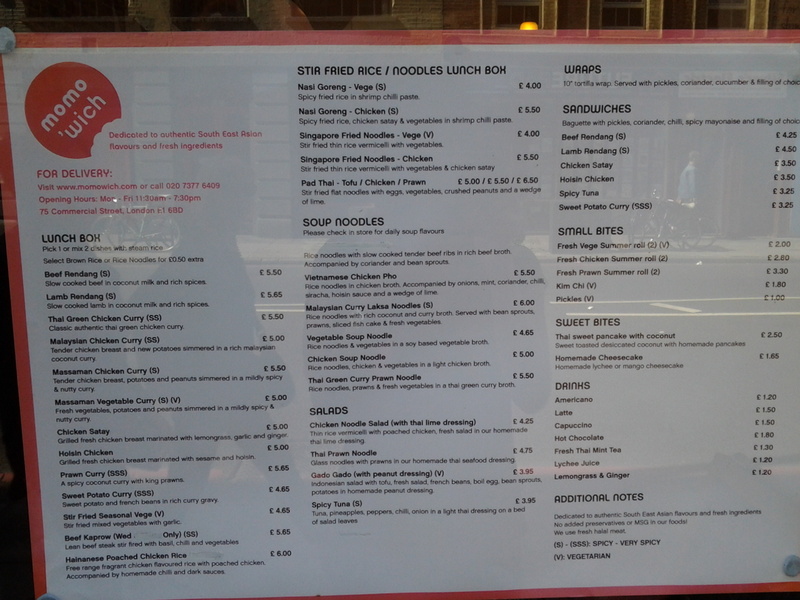 The Gado-gado was £3.95 while the Beef Rendang Baguette was £4.25. With the 5% collection discount, total came up to £7.79. Not a bad deal for the quantity. 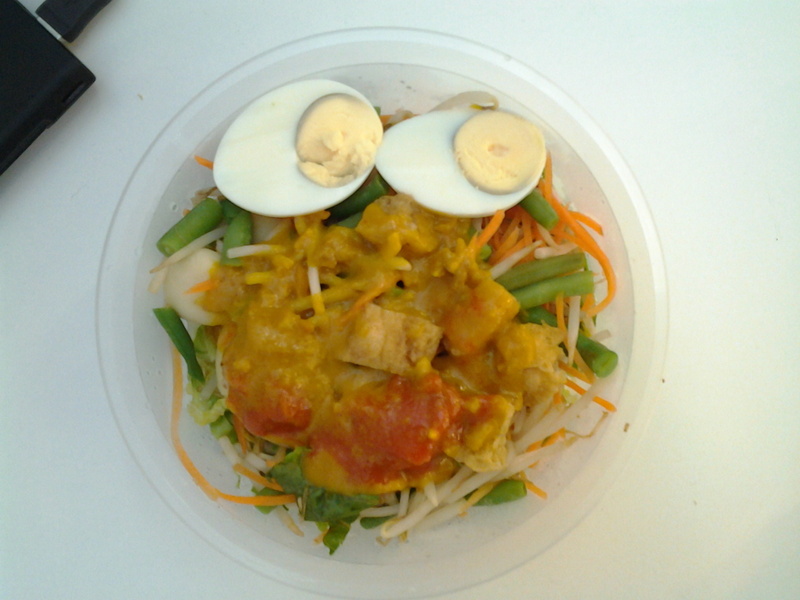 The Gado-gado consist of pieces of fried tofu, green beans, bean sprouts, shredded carrot and cabbage, a hard boiled egg and boiled baby potatoes all topped off with a spicy peanut sauce. I feel that the balance between the quantity of fried tofu and the veg is wrong, there should be more tofu and less of veg. Also, would have liked the peanut sauce to be more grainy, i.e. more solid pieces of peanuts. Ok, I’m being fussy, overall I liked it. As for the Beef Rendang Baguette, it’s filled with pickled shredded carrot and cabbage, slices of cucumber and springs of coriander. All stuffed in a wholemeal crusty baguette. Imagine a Banh mi, I think this is what it’s trying to emulate. The beef rendang was tender and juicy and taste ok. But somehow, something is missing. Pandan leaf perhaps? Then again there are various styles of rendang and for what is was, it’s pretty tasty. I still prefer my rendang on rice. Noticed they also serve a curry laksa! Perhaps I will do a Laksa Off and compare Momo’wich versions with KeKe’s version.